Can You Certify Organic Water? Various companies are selling water that's touted as organic, either as a claim on the label or in the product's name. But can water actually be certified organic? In most cases, the answer is no: water cannot be certified as organic. 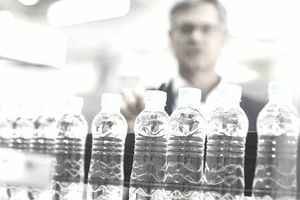 In fact, there are U.S. regulations in place designed to prevent companies from making an "organic water" claim, except under some very specific circumstances. Here's everything you need to know about whether water can be organic, and more specifically, whether it can be certified organic. Under National Organic Program (NOP) policy, water cannot be certified as organic. In fact, the rules go further than that: they state that processors and manufacturers of various organic products must exclude water when calculating the percentage of organically produced ingredients for labeling and certification reasons. Therefore, plain old bottled water, may not be labeled as USDA organic. This applies even if the water is obtained from under soil on land that is certified organic. As an example, say you have a certified organic farm. Even if you source water from beneath USDA certified organic farmland, that water is not eligible to be bottled and sold as "organic water." Other countries also have taken steps to reign in use of the terms "organic" and "certified organic" when it comes to water. There's an exception to the water rule when it comes to flavored waters that contain fruit juice, herbs or other agricultural additives that do qualify for certification. "Regardless of whether water is the main or primary ingredient, it’s only the herb that qualifies for organic certification. Therefore, the product could properly be labeled ‘organic’ if it met the requirements for organic crops and handling/processing." Likewise, the companies AriZona Tea and Poland Springs previously offered tea-infused waters that carried the organic certification seal. To add to the possible confusion, some firms market certified organic coconut water (which of course comes from coconuts, and so qualifies for the certified organic seal). Misleading labels on &apos;organic&apos; water? Despite the fact that the USDA doesn't allow companies to market water as organic, some firms have attempted to get around the labeling rules by incorporating the word "organic" into the product's name in some fashion. For example, companies might state that the water "comes from springs below organic fields," or it may carry a brand name like "Organic Source." While these companies aren't technically making an organic claim or a certified organic claim for their water products, you can argue that they're implying it with these names and labels. If you have specific questions about water as it relates to organic certification, your best source of information is the NOP Program Handbook or your local accredited certifying agent.